The hydrographic survey industry is changing and moving away from manned operations in an effort to reduce costs and increase safety. During the Shallow Water Survey 2015 conference this new approach and the associated challenges were assessed by Swath Services during the collection of ‘The Common Dataset’ associated with the conference. The aim of participating with an Unmanned Survey Vessel (USV) was to determine if it was actually possible to undertake such a high specification challenge with a USV. The common dataset provides a benchmark against which the performance of the USV can be measured. For 2015, The Common Dataset encompassed two survey areas within the natural harbour of Plymouth Sound in England. Participants were required to follow a set of specific operational rules for their dataset to be included. The specific multibeam data collection tasks were split into three categories: Target Detection, Survey Area 1 and Survey Area 2. Each area has its own specific environment and settings. The target detection task was designed to ensure that data was collected over known features and in such a way as to allow direct comparison. In order to achieve this, set line plans were produced and participants were required to adhere to a set speed of 6 knots over the ground, in addition to a swathe angle of 70° either side of Nadir. For the two survey areas 1 and 2 with a depth of 0 – 35m there were no restrictions on survey speed or sonar settings, but participants were asked to deliver a dataset that met S-44 Order 1a. Survey Area 1 with an approximate size of 2km2 included tidal currents, a narrow passage through the Bridge and shallow water (<5m). Survey Area 2 (Figure 1) was divided up into Block A of 2km2 and Block B of 1km2. To meet the high survey specification requirement an R2SONIC 2022 with Integrated Inertial Navigation System (I2NS), Valeport MiniSVS, Trimble RTK (3G corrections) and Hypack Hysweep data acquisition software were installed on the dedicated payload frame of a C-Worker 6 vehicle from ASV Ltd (Figure 2). A further Valeport SWiFT was used on the support vessel. 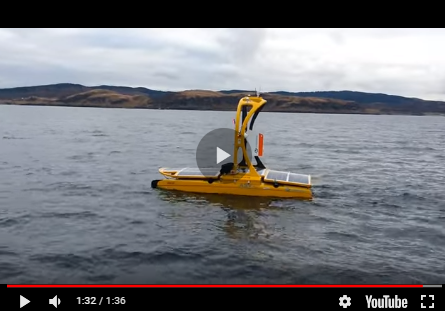 The C-Worker 6 Autonomous Surface Vessel (ASV – Figure 3) has been designed for offshore survey applications: long endurance (up to 30 days), and multiple sensor installation with a quick payload change capability. During this project real-time operational control and data quality checking was achieved through a high powered dedicated Wi-Fi link to the vessel using remote desktop capability. The Shallow Survey events allow five working days to be given to each participant to install and operate their equipment from a designated local vessel of convenience. The installation, offset measurements and equipment testing was conducted onshore (Southampton) during one morning preceding the week of survey operations. The complete vessel and installed equipment was then transited to the survey site via road and lifted into the water (Figure 4). One of the clear benefits at this stage was the ease of equipment installation. There was a dedicated and rigid payload frame that could house the multibeam transducer, INS sensor and poles for the GNSS antennas. This allowed for offset measurements to be taken by hand and then cross-checked against technical drawings without the need for costly dimensional control surveys to be carried out. The other benefit is the repeatability of the mounting arrangement and the reduced need to re-calibrate sensor components. The entire survey was completed in four days including the first day of calibrations. During the survey a survey team was located on a support vessel that was always in sight of C-Worker 6. This was not so much a technical requirement but rather an operational one. Although the rules and regulations for USVs to operate in busy commercial and/or naval ports are yet to be defined, current practice is to seek permission from the harbour master prior to any activities taking place. Although permission was given by Plymouth’s Queens Harbour Master (QHM) and a full risk assessment undertaken the C-Worker 6 was only allowed to operate in these survey areas subject to having an attending support vessel present. In addition to this, VHF communications were used so that the survey team could advise QHM of daily activities and their locations. All survey operations were controlled from the support vessel by remote desktop with the exception of taking sound velocity profiles. As no Sound Velocity Profiler (SVP) winch was present on C-Worker 6 at the time of survey operations, these were taken from the support vessel in close proximity to C-Worker using the Valeport SWiFT SVP. This SVP records a GNSS position prior to deployment at each location and then stores it in the header of the recorded data file. The data file was transferred to the survey laptop onboard the C-Worker 6 via the same 3G connection used for the RTK corrections. Within minutes of taking each profile the HYSWEEP software was applying real-time SVP corrections to the multibeam data. In total C-Worker 6 completed Survey Area 1 (with exception of one target) in a record time of 10hrs 5mins. Survey Areas 2 A and B were also completed in just 10hrs 40mins. This does not include transit time to/from each site, calibration activities or any other down time. Only one other participant recorded completing all areas in the allotted boat time. The ability of the vessel to navigate accurate straight lines by using its autonomy programing considerably reduced field survey time thus increasing overall survey efficiency and productivity. In areas where the depths changed dramatically or the vessel was close inshore direct remote control was chosen by the operators. Direct remote control, which allows the operator to very quickly change course or bring the vessel to a halt, was used in conjunction with onboard cameras and georeferenced background charts to avoid obstacles in the water. This was especially evident when avoiding many of the lobster pot buoys, sailing dinghies and diver charters. The performance of all survey equipment was no different than on a manned vessel and met IHO Order 1A. Quality checking and adjustments were made as if a surveyor was present on the vessel. The only difference was the slight time delay in the remote desktop update rate, which meant that any adjustments to online filters were delayed. Fortunately, the R2SONIC automatic filters tracked the seabed effectively reducing the need for manual adjustment. Despite this, these delays had no effect on operational capabilities, such as the ping rate of the sonar. Data was logged on the vessel which allowed for greater ranges of up to 10km to be possible between the support vessel and USV. The target areas (Figure 5) proved challenging due to the fast tidal currents in these areas. The maximum speed of C-Worker 6 only just reached the required 6 knots over the ground. Strong currents also meant that additional time was required to make vessel turns and to ensure offline distances remained within specification, however, this was no different to being on a manned vessel. One of the lessons learnt occurred onsite when the original survey line plan could not be imported into the navigation system on C-Worker 6. This resulted in additional time being required to replicate the line plan manually on route to each location. Another significant consideration was that although the SVP solution onboard the support vessel was very effective in Survey Area 1 there was limited 3G reception in Survey Area 2, which not only meant that the SVP data could not be transmitted to the unmanned vessel but that unreliable RTK corrections were experienced as well. Consequently, the SVP profiles had to be added at the post processing stage and the Applanix POSPac software used for post-processing all positional data. Thanks are due to ASV Ltd for their support during the survey.